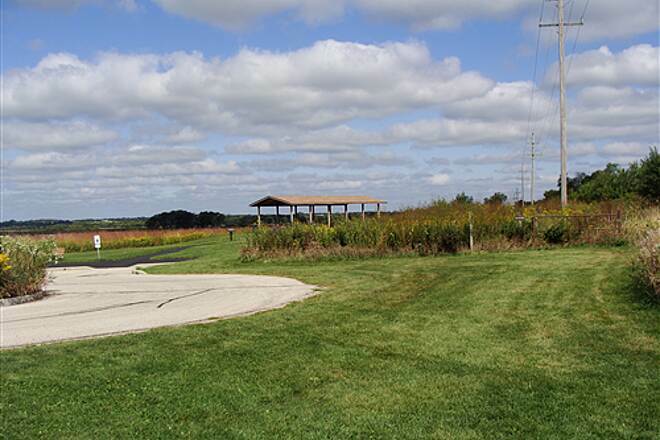 The Prairie Trail runs the length of McHenry County and is managed by the McHenry County Conservation District. 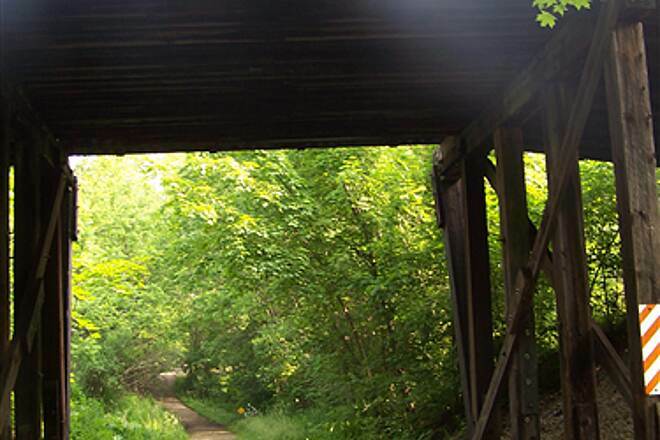 The rail-trail spans just over 26 miles from the Wisconsin border and the farms and woodlands along its northern half to the far-flung Chicago suburbs in the south. 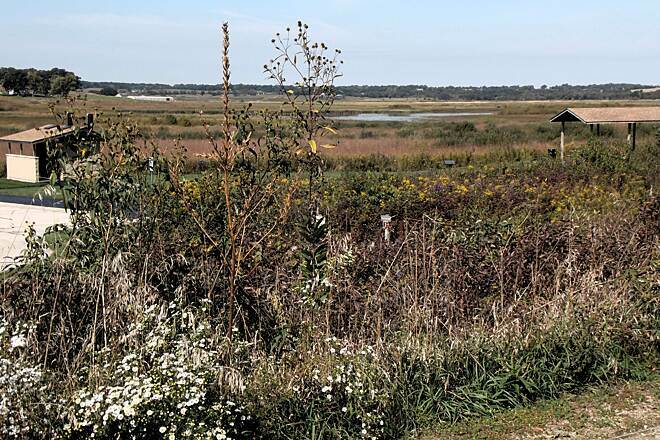 Along the way, it upgrades from gravel to asphalt and passes through eight communities, where you’ll find food and drink, as well as numerous parks and conservation areas. 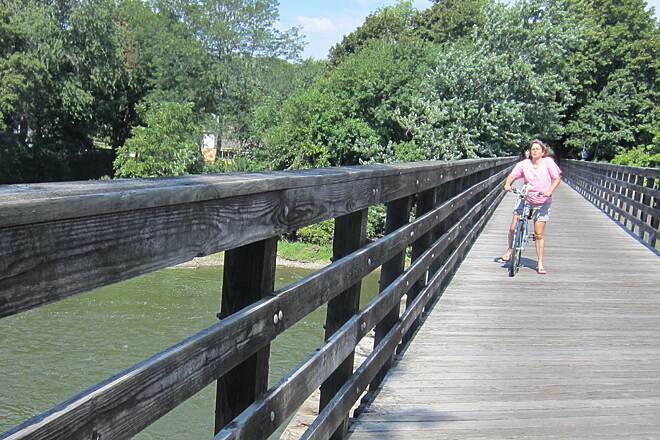 Built on the Fox River Valley alignment of the old Chicago and North Western Railway, the Prairie Trail meets the Hebron Trail in the north and seamlessly joins the Fox River Trail after crossing into Kane County. 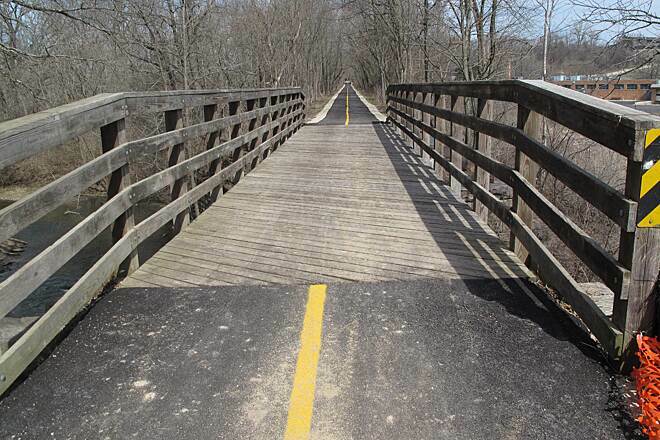 It’s part of the 500-mile Grand Illinois Trail for its entire length. 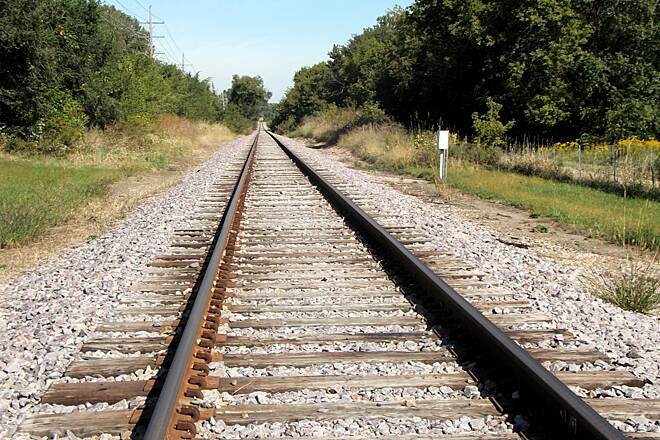 Four Chicago and North Western Railroad lines began serving McHenry County in the 1850s, about 20 years after the first prairie settlements took root. At first benefiting the dairy farmers and cheese makers, the railroad later carried vacationers anxious to escape Chicago’s sweltering heat. 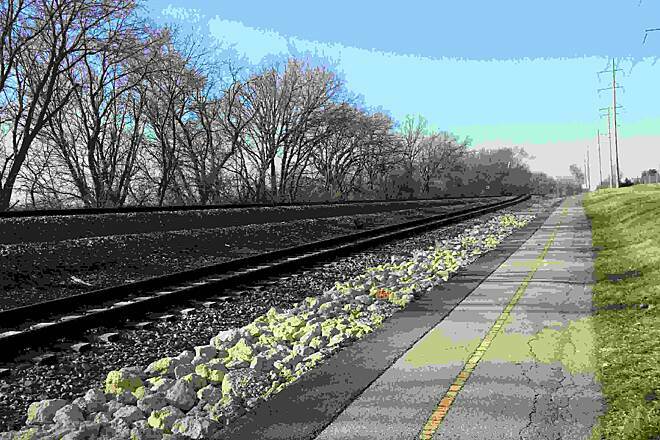 After World War II, the railroad helped spur growth in towns like Crystal Lake, McHenry, and Algonquin by offering commuters a way into the city. 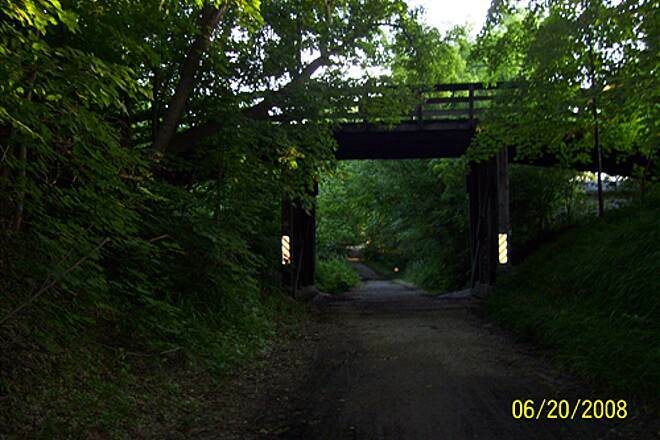 Today, the Metra commuter rail line shares the corridor with the Prairie Trail between McHenry and Crystal Lake. Starting at the rural Wisconsin-Illinois border, you’ll find the trail is a rough and sometimes muddy mix of dirt and gravel. 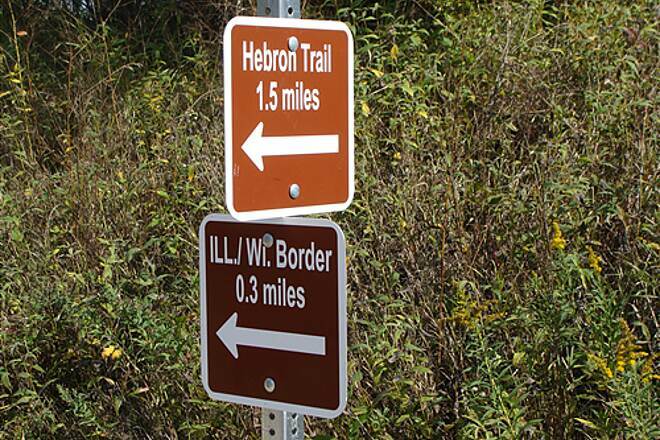 The junction with Hebron Trail comes up in 0.3 mile as you pass the North Branch Conservation Area, where there’s parking, drinking water, and primitive camping. In 1.3 miles, the trail passes through the village of Richmond, partly below grade with street bridges overhead. 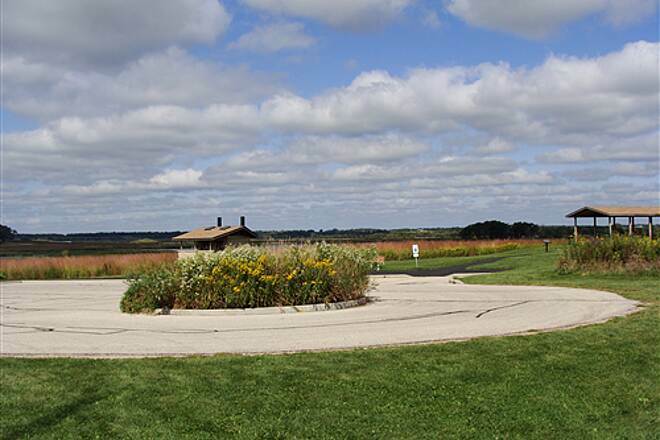 The trail surface improves to crushed rock as it passes farmlands and a 2.5-mile section of the 3,400-acre Glacial Park. 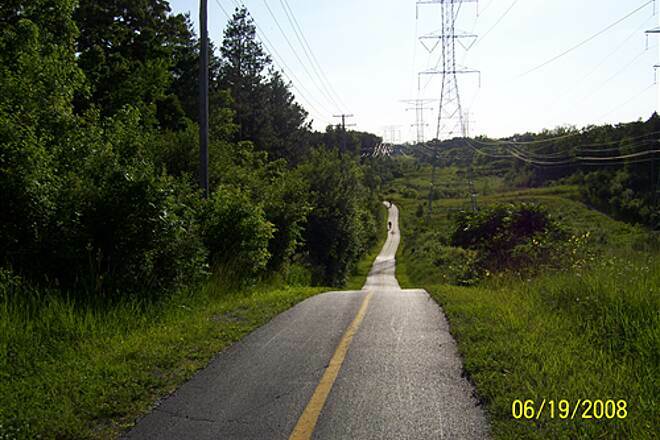 The trail improves once again a mile after leaving the park when it turns to asphalt in Ringwood. 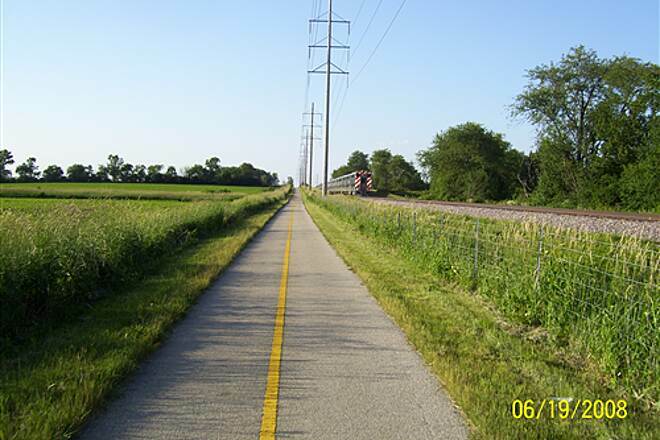 Entering suburbia, the Prairie Trail leaves the corridor and shifts onto local bike paths and bike lanes for about 1 mile in McHenry. Six miles later, just north of Crystal Lake, the trail again leaves the corridor for a 2-mile section through rugged Sterne’s Woods, the most forested part of the trail. 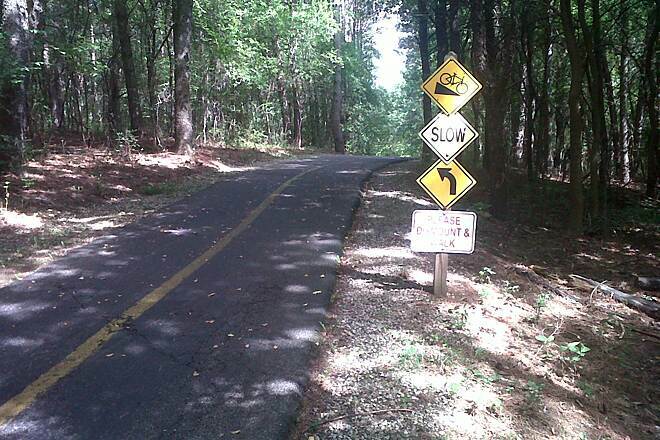 The hills are short and very steep; cautionary signs warn bikers to dismount and walk down treacherous slopes. Rejoining the corridor, the Prairie Trail takes a 6-mile downhill grade to Algonquin and the Fox River bridge that sits atop original limestone pillars. 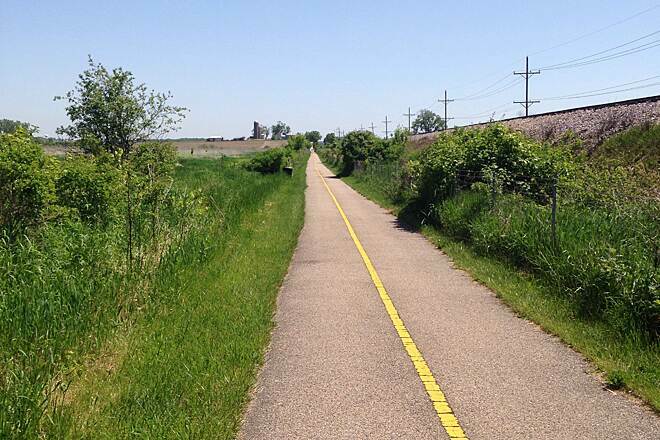 The Prairie Trail ends in 0.6 mile at the McHenry-Kane county line, where it becomes the Fox River Trail. 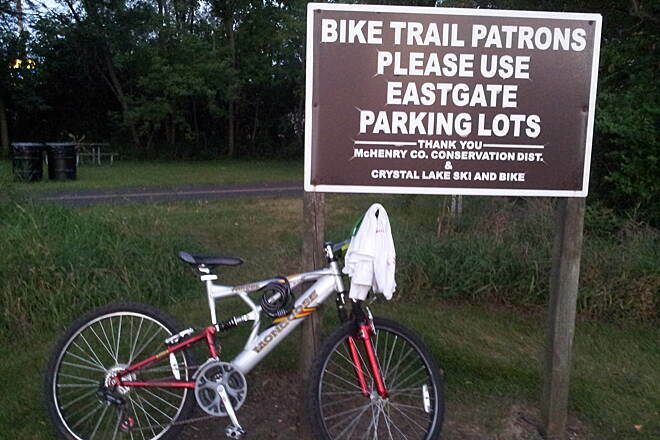 There is no parking at the two trail endpoints, only trail access. The closest parking locations to the north and south endpoints are outlined below. 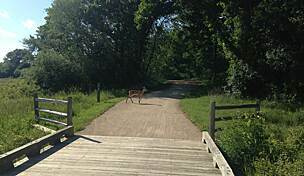 To reach the northern trailhead at the North Branch Conservation Area: From I-94, take Exit 2 for IL 173/Rosecrans Road. Head west on IL 173 for 19.1 miles. 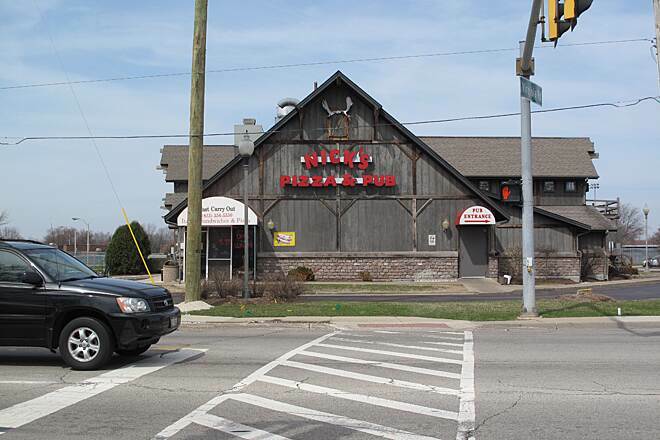 Turn right onto Broadway Road, then go another 0.7 mile and turn right onto Keystone Road. The North Branch Conservation Area parking lot is on the right in 0.6 mile. Go 1.4 miles east on the Hebron Trail through the conservation area to the Prairie Trail. 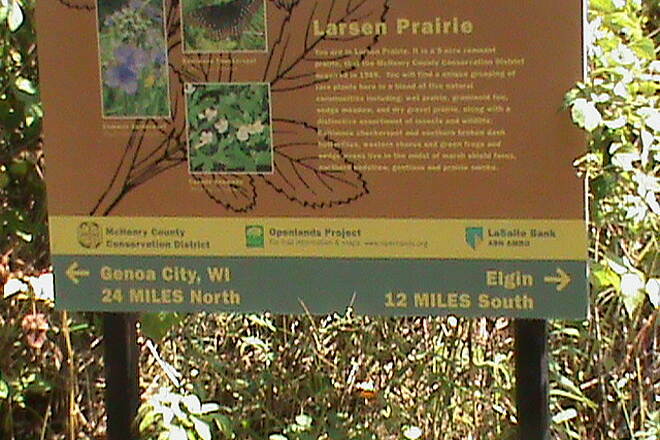 The trailhead is 0.3 mile north, just across the border in Genoa City, Wisconsin. 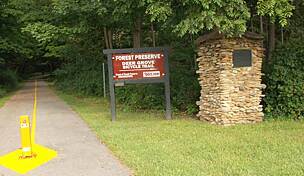 To reach the southern trailhead in Algonquin: From I-90, take the exit for IL 59 near mile marker 60. Go 3.3 miles north on IL 59, and turn left onto Algonquin Road. In 7.6 miles turn right onto Meyer Dr. 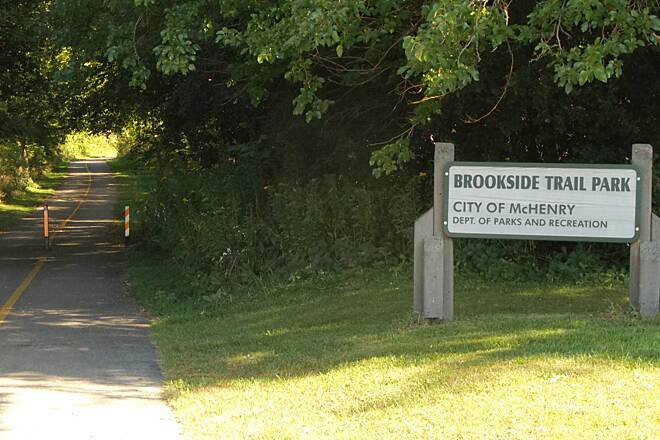 In about 300 feet, turn left at the first entrance marked with the sign "MCCD Prairie Trail" parking lot. The parking lot is at the end of a 0.1-mile-long driveway. 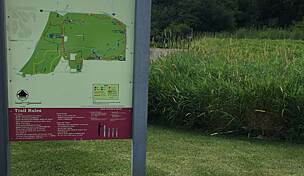 A 0.1-mile trail joins the Prairie Trail. 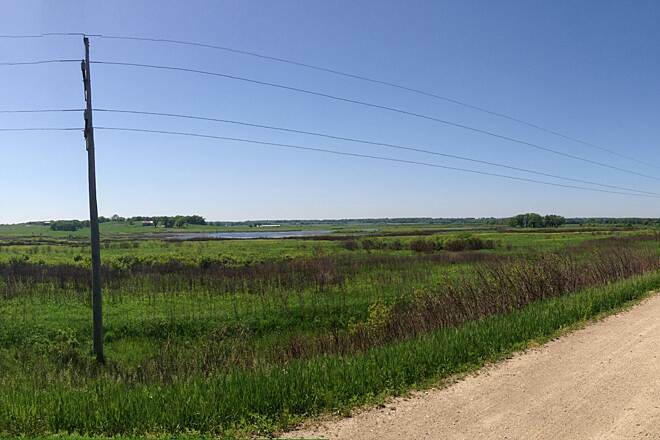 I rode north from the Fox River Trail to just a little past Hwy 14. The trail was about perfect as it seems to have been repaved in the not-so-distant past. There were plenty of benches to stop and rest if one chose. It was a bit of a suburban trail in that it doesn't really connect to much. At one point I thought about stopping at a gas station, but there was a wide ditch with native plantings separating the gas station from the trail, so there was no access. All in all, though, it's a great trail for a recreational ride. Attempted to bike through Sterne's Woods yesterday after just parking my car in the gravel parking lot at the entrance in Crystal Lake. It had rained the night before but the pavement in the sun looked dry. Within 50' of the entrance is the first hill down and I wiped out while braking as that pavement was wet. It's very steep there and you absolutely must brake. I've never wiped out in 10 years of biking so it's something about that pavement when wet. Be careful. I recommend not taking children through there. By the way, you cannot go south on the trail there. You must find it in Crystal Lake somewhere. I rode for 30 minutes trying to find it, but never did. The signage is poor. 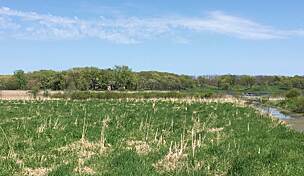 May, 2016 by ben i.
I rode the entire trail as part of a century with my turn around point being the northern end in Genoa City, WI. The trail is fun and as mentioned by some other reviewers, water and bathrooms are surprisingly plentiful, mostly in the more built up areas. While the hills in Sterns Woods are steep, they are few in number, at most 5-6. As long as you keep your speed up going up them, you'll be fine, albeit with some effort. As far as going down the hills, brake while going down and make sure you're watching where the path goes and you won't have anything to worry about. Besides Sterns Woods, the path is quite flat with only gentle changes in elevation. 1) Maybe 5-10 miles south of the WI border (can't remember for sure) the path is gravel/good sized rocks. Definitely gets a little bumpy but nothing to bad but I was on my gravel grinder with 35mm tires. Had I been on my road bike I would have never been able to go thru it. 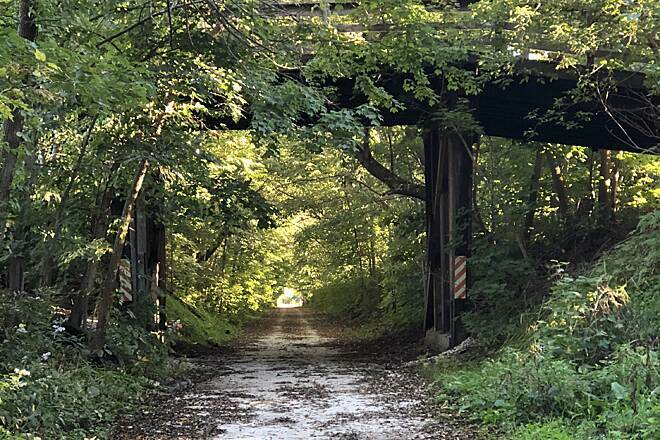 2) Between McHenry and Crystal Lake the trail runs along train tracks (and underneath powerlines) and there is absolutely no shade whatsoever for 5-6 miles. If it's a warm day make sure you have plenty of water for this section to stay cool. All in all, a good trail but won't take it all the time. I found the bathroom and water opportunities to be frequent enough for my needs and had no problems following the bike route signs, especially in Crystal Lake, between trail sections. And even at the busiest non-signal road intersection I only had to wait a couple of minutes before I could cross. I'm writing mostly to counter what I feel are the exaggerated warnings about the Sterne's Woods' hills. If you ride regularly on the open road you'll wonder what the heck people are talking about. There are only five hills and they're only a few 10's of yards long up or down. I managed to climb them all (barely) even though my lowest gears were a 42 front and a 25 rear. Even a casual rider with a hybrid or mountain bike should have no problem riding up the hills (albeit perhaps slowly). As to the downhills, they're called brakes--use them. And if you feel uncomfortable going up or down just get off your bike and walk. 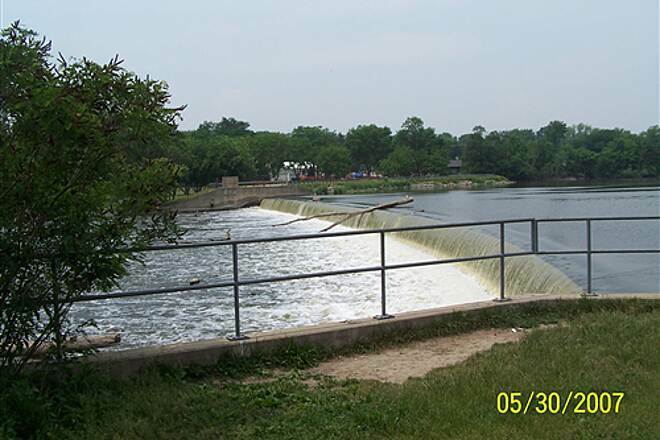 I am so glad we started our ride at the Wisconsin border and rode all the way south to the Fox River Trail.. In the north, we especially enjoyed the more rustic part with the crushed rock surface – the glimpses of old village Richmond, the bridges overhead, and the wonderful panoramas of Glacial Park. 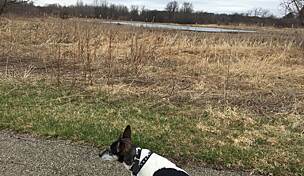 Then continuing in Crystal Lake, there was the beautifully landscaped linear park along the trail and the nearly effortless and gradual drop in elevation all the way to trail's end. But Sterne's Woods was a killer! This section is no multi-use trail at all! Unless you're a super strong rider, you'll never make it up the incredibly steep hills without getting off and walking. And several of the hills down are so precipitous that there are large red signs warning riders to dismount and walk their bikes down them, instead of riding. I can only guess that local EMTs have already collected too many broken bodies of bikers who thought it great sport to defy injury (and more) by pushing their thrills to the limit. I would have rated this trail much higher if it were not for the section through Sterne's Woods. My husband and I took advantage of the perfect weather and rode the trail on 9/21/15. We stayed at a lovely B&B, the Victorian Rose Garden in Algonquin which is right next to the bike trail. We arrived in the morning and left our car there, returning late in the afternoon after our ride. 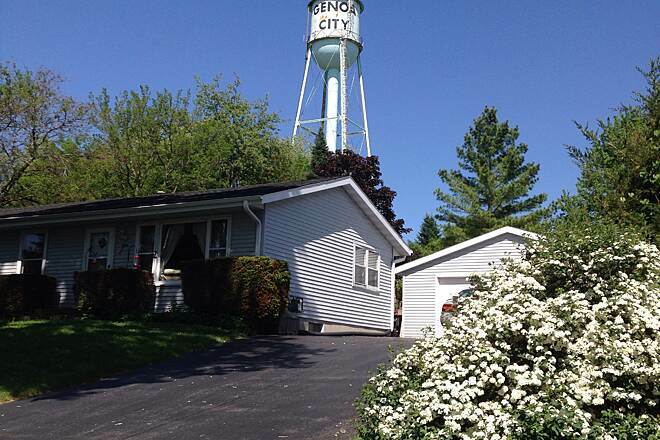 Around Crystal Lake, there are some busy streets to cross and a tricky route through a residential area. Sternes Woods is the next adventure - don't be afraid to dismount and walk your bike up and down a few of the STEEP hills. 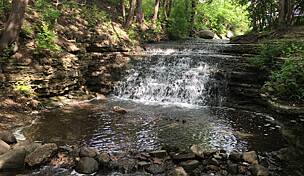 It is a beautiful part of the trail. When you get past McHenry, there are long stretches of prairie. Take plenty of water because there aren't many places to stop until you get to Richmond, which is right next to the trail. There are restaurants there, although only one (great ice cream and deli shop) is open on Mondays. 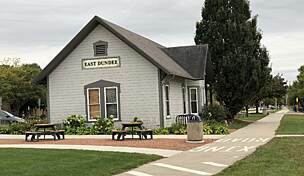 From the B&B, it is 26 miles to the end of the trail. It's paved until Ringwood, when the packed gravel begins. It was a great experience! The Trail is in good repair (with minor issues), and is well maintained. 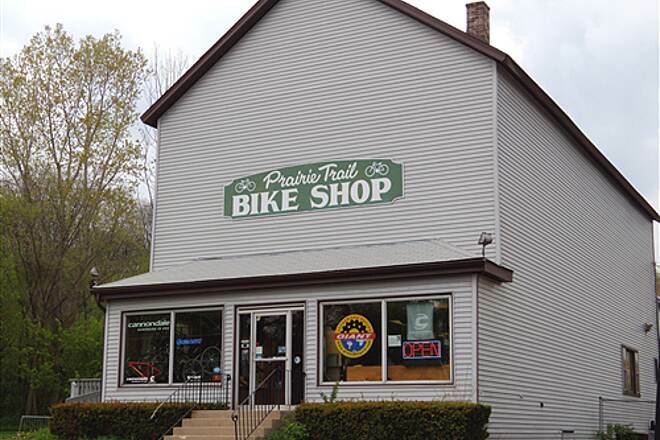 The folks using this trail are mainly from the 'boonies', and are friendly and approachable. Many of the maps at checkpoints are difficult to make sense of, and some didnt even tell us where we were (luckily we are locals). Aside from the issue with the maps this trail is a blast. Also, beware of sterns woods. Its a very difficult length of trail. many sharp curves, and excessive slopes. 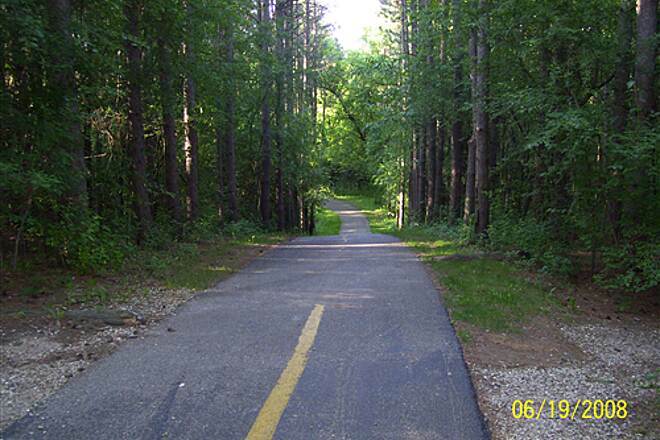 I rode the trail starting just north of Stearns Woods in Crystal Lake riding north late in the day on 3/21/15.The trail is pretty narrow but well maintained. I can see the narrow width being a hassle on busier days but not much of a problem around 5pm with temps dropping into the 30s. :)As previous reviews mention it is fairly wide open with little shelter on this part of the trail. As such, I wasn't expecting to see much wildlife but I saw a beautiful blue bird just as I hit the start of the trail. This was followed by various other "typical" birds; robins, cardinals, blackbirds and finches. The one bird I didn't expect was a turkey! It rustled in the bushes above the trail and briefly flew out and away (yep, they can fly!). I also saw a large jack rabbit.The ride itself has some nice hills. Not killer hills, (head south into Stearns Woods for those!) but a few that are somewhat challenging. There are quite a few stop signs thru McHenry but you can get by fairly quickly. 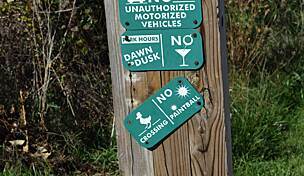 Directional signage on the trail is decent and where absent it's pretty intuitive.I didn't quite make it to WI as the temps were dropping and sunlight fading but I did make it off the asphalt onto the dirt/limestone closer to the border. A bit soft in parts from recently melted snow but still solid enough for my thin road bike tires. There were a LOT of hoof prints in the dirt from horses that did make for a bumpy ride but nothing too serious if you're taking it slow.Overall, an enjoyable 24.5 mile roundtrip. I will definitely give this trail some more miles this summer. I recommend it for a casual ride. I use this route for long runs and to break up running in subdivisions. This is a great trail which has both crushed stone and asphalt. The trail runs long preserves and fields making the trail enjoyable. While there are a few areas that are under construction, they are well marked and easily navigated. I have not yet used the full trail. My experiences have been limited to the northern-most 10 miles. 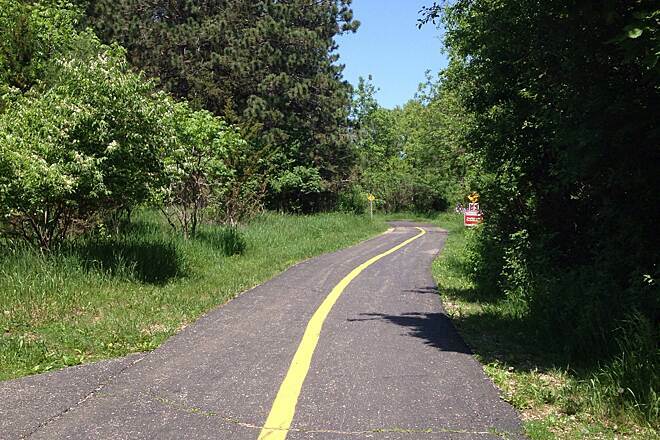 Update: New trail section now complete through Algonquin bypass construction zone. Although at the time of this post the Rt. 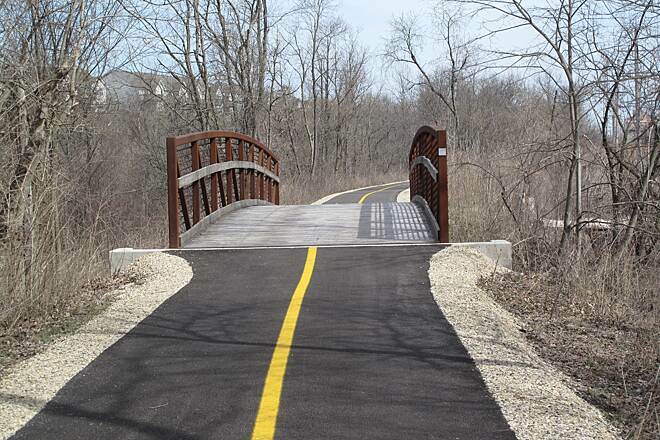 31 Algonquin bypass has still not opened, the new asphalt bike path around it is complete and open for use! 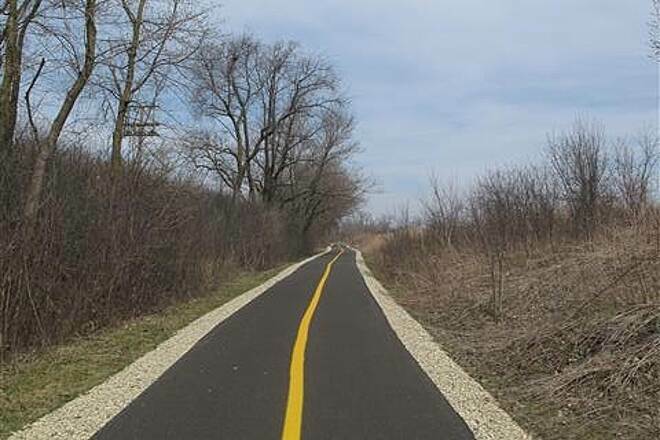 Unfortunately, it's always something with this system of trails hugging the Fox River. While it had been possible earlier in the summer to simply walk your bike around it, there is now NO way to safely bypass the construction zone under the I-90 bridge construction in Elgin. Part of the I-90 tollway widening project, expect this closure to last through the 2016 season. It looks like a war zone there and the area is fenced off with warnings that trespassers will be arrested. Very beautiful trail. It' worth mentioning just outside of Genoa City is the Hebron trail junction. Very nice ride as well. 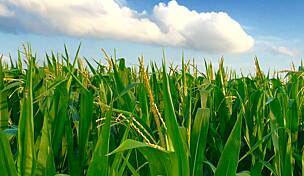 Don't forget to detour to Lost Valley (part of Glacial Park) just south of the Richmond Burton High School on Harts Rd. Stearn's woods was the highlight. Amazing little ride through beautiful wooded, hilly track. Wanted to get to Algonquin. Got confused in Crystal Lake and turned around. Will take map next time. Hey, what about us Android phone users? When will maps be available to us? I have been riding on the roads and in the Nippersink Forest Preserve and found the roads to be just too "serious" and Nippersink to be just too repetitive. It was time to find a new place to ride. I got online and looked for bike trails nearby (that were more than a few miles long). I came across this trail and figured I'd give it a shot. I entered the trail in McHenry (pretty much the middle of the trail)and after parking my car in the park parking lot (for free) I headed north towards Wisconsin. I figured the 23 mile round trip was just about perfect. Once you're actually on the trail (there is a pretty busy street you need to cross to continue on the trail from the park) it's a real pleasure. The first 5-6 miles are asphalt and I found this stretch to be the most populated. More so with walkers than other bike riders. This was kind of annoying because everyone walks right down the middle and have no clue as to what might be coming up behind them. After you get past the people the trail turns into limestone, dirt, gravel, etc. (all very will maintained) It was all good, but be on the lookout for horse poop. I came across some pretty large piles of it. The ride is pretty and laid back. It's great for someone really trying to work hard, but it's just as good for someone just out on a leisurely ride. The next time out, I will try to take in more of the sights. When I did happen to get up out of the drop bars, what I saw was pleasant to the eyes. Next time out I will head south and see what that's all about. Fingers crossed it's just as good as heading north. 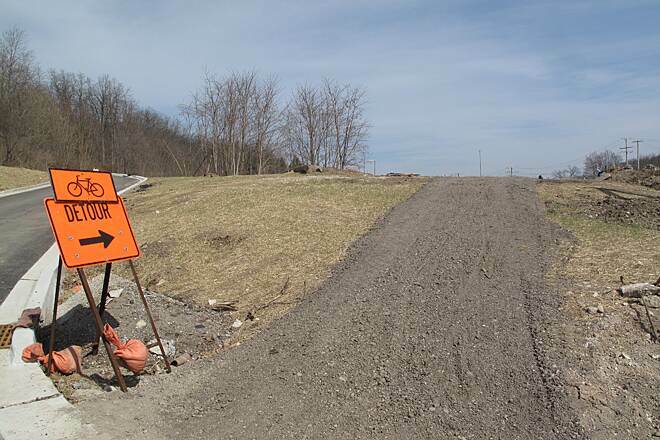 anyone heading out on this trail, yes route 31 construction will be a mess. The old trail coming down from Algonquin is torn up just after the bridge on rte 62, we were able to ride on the older part of the trail that is now gravel. 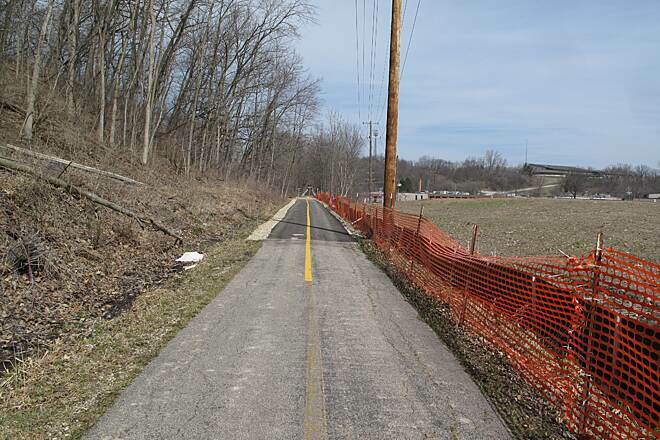 Looks like the trail will be re-routed along the other side (by Verns taxidermy) and loop around back to the trail. One of the most well maintained trails. Great for all rides including beginners who will enjoy mostly flat smooth asphalt. I wish there were a few porta potties along the trail. Trail impassibly severed by Rt.31 Algonquin bypass construction. The most recent reviewer mentioned the new detour signs heading north on the Fox River Trail just before the construction zone at Rt. 31 in Algonquin. I decided to follow it. 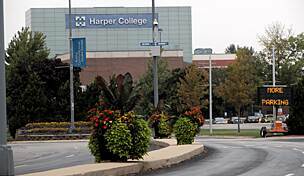 The detour is a false hope and should be avoided. It takes you across Rt. 31 a couple blocks north of the trail and deposits you into a small park. But that's as far as it goes. I explored a little and could find no way to get past the construction zone. Anyway, you can't get over Algonquin Road. Algonquin Rd itself is busy and very steep heading west past past Rt. 31 - and there's no shoulder because it's torn up for construction. Trying to ride up it to get to get to Pyott Rd would be an extremely dangerous and anti-social act. I can't see any way around this closure for all but the most intrepid cyclists; it's just not worth the risk. I was there yesterday, and there are multiple signs warning of upcoming repairs as well as several detour signs when headed northwards. I turned around there instead of following them and can't comment on the detour, but you can't miss the signs. Update to trail closing. Bridge in Algonquin is out, "POSTED": closed until further notice. My guess is it will be closed until September 2014. Whoever is managing this trail has dropped the ball big time. Probably the same people that are handling the state's pension reform issues. WARNING: 2013 Trail is closed/blocked in Algonquin, NOT posted, no detour! Took my 7 y/o out yesterday for a trek. 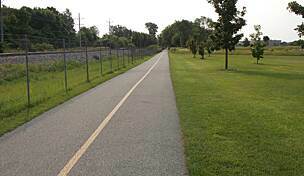 Accessed the trail @ Fort Mchenry in Mchenry headed south from there. Once past Lake in the Hills we came to the sand/gravel area of Arrow Road Construction. Immediately adjacent to Arrow the trail is blocked by fencing and a large pile of dirt. A few hundred yards after that a bridge has been demolished for replacement at a later date. There are no warnings, no signs, no detours, nothing, once you follow the nearby connecting trail you're dumped in a small subdivision with no clue on where to go. The only way out is to take Pyott road which at that point is 4 lanes that have heavy traffic at most times of the day. I don't know who manages the trail at this point but they've dropped the ball with respect to handling this trail closing. I joined this trail at Algonquin as part of my trip from Chicago to Bemidji it was a credit to those who maintain and look after the trail facilites.It never failed to impress the whole of is length. 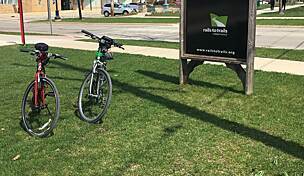 I drove my car to Harvard and took my bike on the Metra down to Crystal Lake ($5.25). Then I biked the Prarie Trail to Genoa City and joined the Hebron Trail to Hebron. For the final ten miles back to Harvard, I rode on Hiway 173, which, though busy, has a wide shoulder. I enjoyed this route! It was 35 miles long and I liked taking the train and not having to go back on the same trail. If you do this route, remember that on the weekdays, Metra won't allow bikes on the train during certain hours (check Metra website for details). However, on Saturday and Sunday there are no restrictions (except for special events) and a $7 ticket is good all weekend. Also, I costs $1.50 to park in the Metra parking lot, but drive a few blocks away from the station, you can find street parking without time restrictions. My wife and I rode this trail on Sunday, September 4, 2010. I just bought a new bike and wanted to try it out. I found the trail exciting as we entered in Algonquin and rode all the way to WI state line. Roundtrip it was about 52 miles. I was not expecting the hills in the Crystal Lake forest area. Going down was a thrill but coming up after 40 some miles was excruciating. I just walked them. Beautiful country-side with plenty of areas to stop and rest. It took us about 4.5 hours riding to make it round trip. "The asphalt sections of the trail from Ringwood to Algonquin ride well as a whole. The section from the south end of Crystal Lake to Algonquin is starting to show its age as it was built in the 1980's and it has occasional bumps. From Crystal Lake to Ringwood, the trail is in good shape. 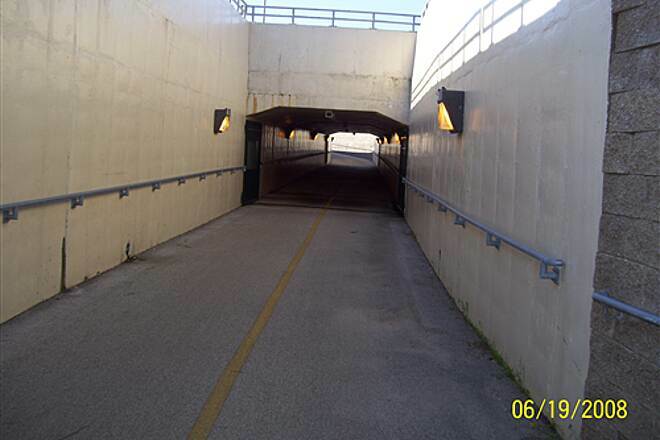 I found the walk bicycles downhill in Veteran Acres Park , across Terra Cota Road (IL 176) and across rail road crossings to be offensive and need to be removed. " "I can't believe no one's reviewed this trail. The northern 7.5 miles are just awful and I've only ridden part of it once on a bike with no suspension. From Ringwood south, though, it's paved asphalt. 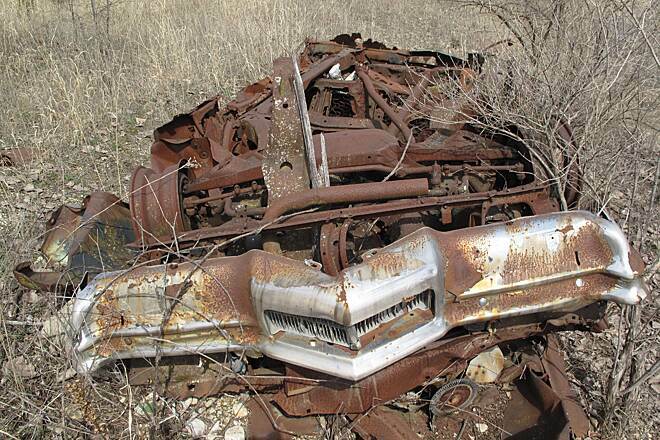 A good place to park your car is in McHenry. There's a little park on Route 120 across the street from the IHOP. There's restrooms and vending machines. The ride south has a couple of dangerours street crossings but other than that, it's easy riding with very few people on the trail. At the north end of Crystal Lake, is Veterans Park. There's a parking lot there. The park has the nastiest hills I've every ridden. There's three steep, winding climbs in each direction and I usually end up walking up at least one hill. It's only about a 2 mile section but it is still awful. Make sure you're in low gear. South of the park, you ride on quiet side streets. Just follow the signs until you come to Main Street. There it's back on the trail heading south. Again, more parking and restrooms and a bike shop. 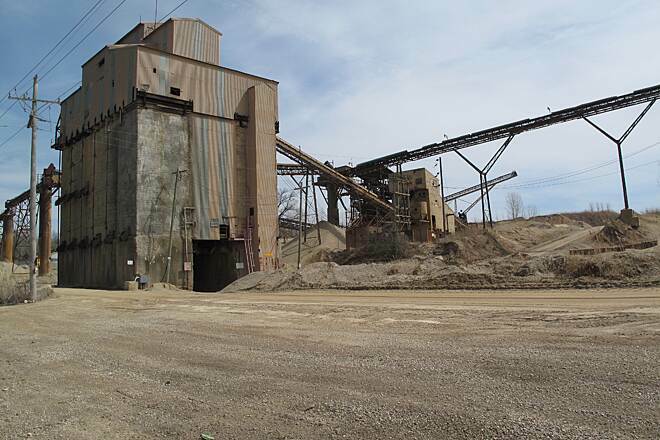 South of Crystal Lake, the trail enters a quarry for a 3 mile down hill run to Algonquin where it connects with the Fox River trail. Keep on going all the way to Aurora if you want. I have found this trail to be well maintained with usually few people on it and convient services along the way. It makes for a very enjoyable ride."